Good morning! Can you believe it’s already Thursday? I’ve spent so much time organizing the new place that I seem to have lost track of time somewhere along the way. Our boxes are unpacked, pictures are hung, and our separate offices are setup just the way we like them. I even have a little space for my food photography now! I’ll take you on a tour tomorrow. Today marks the final post in the 3 week series of guests to visit the blog and I couldn’t have chosen a better colleague to wrap things up than Sonnet. Her blog, For The Love of Food, showcases some of the most delicious, vegan recipes I’ve ever set my eyes on. Her creations are simple, clean, and finger-licking good. Paired with her ability to make her readers giggle at each story she shares on the blog, For The Love of Food is fresh space filled with a powerful resource of healthy living tidbits. In true For The Love of Food style, Sonnet shares with us a super creative way to enjoy your daily dose greens. I was so intrigued by this recipe that I made it the same day she sent it over to me. Wow does she have a good thing going on here! Sweet kale is the way to go, people. Hi! I’m so excited to be guest posting for Leanne this week while she is getting her new life set up in Montreal! My name is Sonnet and I blog over at For The Love of Food, a seasonal, plant-based cooking blog that’s filled with my random stories about life and quirky humor. As a holistic health coach and food educator, my goal is to demystify different vegetables, legumes, and whole grains with simple, delicious recipes that you can easily recreate in your own kitchen. I am always inspired by Leanne’s creativity, especially around dessert, so this week I decided to turn one of my favorite vegetables into a salty, coconut-y, chocolate-y indulgence. Are you ready? Good. But first, let’s talk about Oprah. Like most people I have a couple of big regrets in my life. But the biggest one? I never watched Oprah. But as an adult, I never sat down and watched it. And now that she’s off the air, I feel like everyone keeps talking about her. The bottom line here is that I really think I missed out. I learned an important lesson from this: Jump on the bandwagon. Join the crowd. Follow the trend. And sooner rather than later… because one day it will be too late. 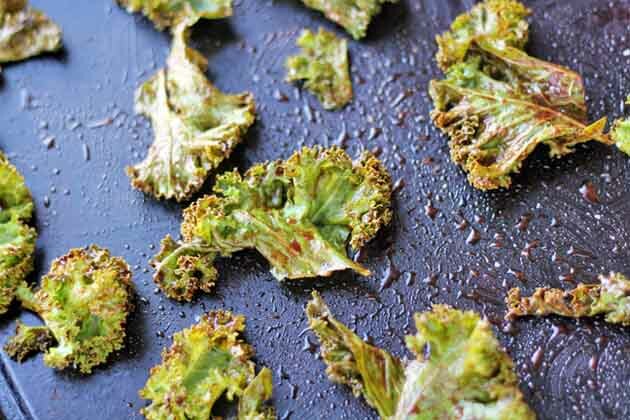 Besides missing out on Oprah, the other regret I have is not turning kale chips from a savory, salty snack into an even-more addictive sweet treat sooner. Clearly I had been missing out and didn’t even know it. 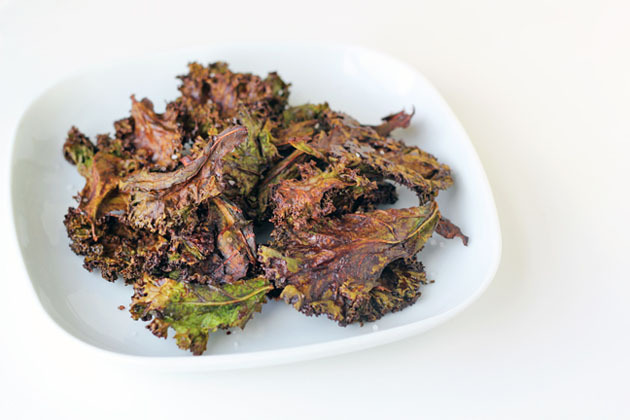 That being said, have you jumped on the kale chip bandwagon yet? If not, then now’s the time. I certainly don’t want you to live with regrets. My friend caught me in the middle of the kitchen stuffing my face with these chips. Naturally, she used the opportunity to make fun of me: “Why would you cover kale chips with chocolate? Isn’t the whole point of kale chips to eat healthy?” Clearly, she does not understand. The point of kale chips isn’t that they are “healthy.” The point is that they taste good. 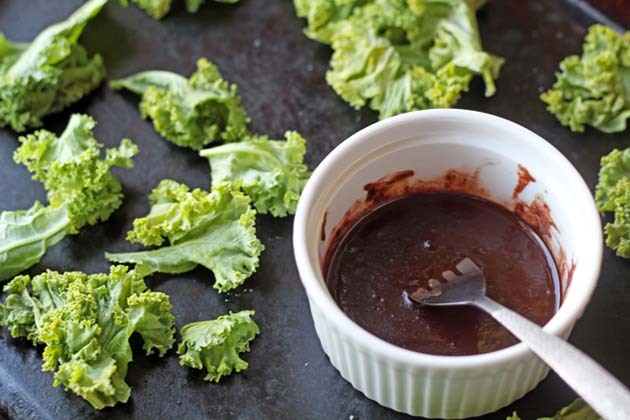 And, why wouldn’t you cover kale chips with chocolate? I may not know Oprah very well, but I have a hunch she would be on board with this one. 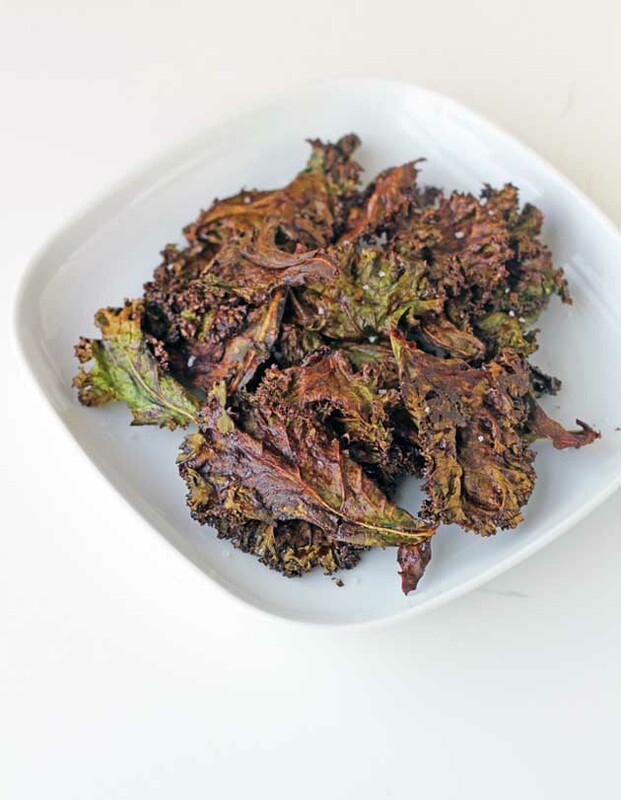 Dessert kale chips covered with chocolate and coconut oil. Preheat oven to 350 degrees. Mix coconut oil, cocoa powder, and maple syrup. Toss leaves in chocolate-oil mixture and coat thoroughly. 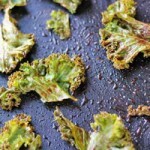 Lay flat on sheet pan, making sure kale is spread out and not touching. Top with sea salt and bake about 15 minutes, turning at least once, until chips are crispy.